SAMMY'S PERFORMANCE - MORE IMPRESSIVE THAN BEIJING? 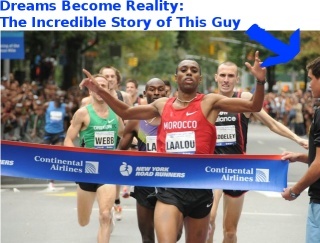 Could Ryan Hall have had the balls to make podium if he raced today? 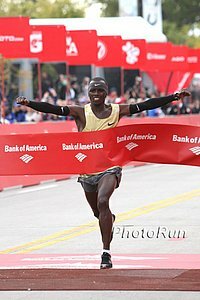 In a thrilling, late-race, back-and-forth battle of attrition between two of the world's greatest marathoners, Sammy Wanjiru revived his career stamped his career as legendary with his 2nd straight Bank of America Chicago Marathon victory. This time Wanjiru had to dig deep to come back repeatedly against London and Fukuoka champ Tsegaye Kebede. In the women's race, front-running Atsede Baysa blew up in the final 10km as Liliya Shobukhova motored steadily to her 3rd consecutive World Marathon Major win, sealing a $575,000 payday in the process. Americans Jason Hartmann and Desiree Davila impressed with PSs of 2:11 and 2:26 and 53-year-old Joan Benoit-Samuelson ran sub-2:50 for the 5th consecutive decade with a 2:47. Elites Will Be Done Way Before 80-Degree Heat Heats Chicago Race director Carey Pinkowski: "I would imagine that the first two hours of the race should be very accommodating.. For them, it's going to be optimal opportunity to go fast."